Symon has been a Shortlisted Composer several times for the Society for the Promotion of New Music and Sound and Music. 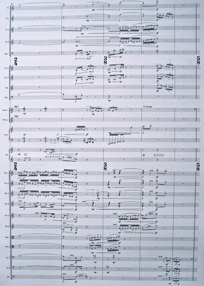 As a student at Kingston University Symon composed music for string orchestra, two string quartets for the Medici String Quartet and a large scale orchestral piece, to a commission from the Stoneleigh Youth Orchestra, entitled The Place of the Solitaires, which was performed to critical acclaim at the Fairfield Halls in Croydon. His music has been broadcast in Music in Our time, Hear and Now and Late Junction on Radio 3 and elsewhere in Europe and Asia. During the 1990's Symon concentrated on studying, playing and composing for the Javanese gamelan, acting on a long standing interest in this traditional music following an extended visit to Java and Bali in the early 1980's. These pieces have been performed by the South Bank Gamelan Players and Alpha Beta Gamelan across the UK (with Barbara Gaskin and Mary King mezzo sopranos) and by groups in Europe and Asia. Several concerts have included the orchestral original of Short Ride in a Fast Machine with its gamelan companion by the LSO, BBC SO and the Philippines Philharmonic Orchestra. Midnight Verses (for clarinet and marimba) performed widely in Europe by Tara Bouman and Stephan Froleyks. Endgame (for percussion quartet) performed by Klangwerk Münster. Time's Eye (for mezzo-soprano, clarinet, vibraphone and violoncello) performed by Tine Verbeke and the Concorde Ensemble. Statue Circle (for large orchestra) performed and broadcast by the BBC Philharmonic Orchestra under James MacMillan. Dimensions of the Present Moment (for flute, clarinet, violin, violoncello and piano) performed by the Chromatico Ensemble. Pour Finir Encore (for chamber orchestra) was highly recommended in the Uuno Klami International Composition Competition in Finland and recorded by the Brno Philharmonic under Mikel Toms. String Quartet No 3 performed by the Kingfisher String Quartet. Nine Sonnets in Memory of John Clare (for Violin and Piano) performed by Beth Spendlove (Vln) and Nigel Clayton (Pno). 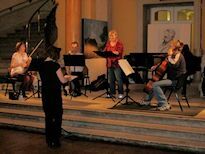 Threnodia (for Clarinet Quintet) performed by the Kingfisher Ensemble. ... if not, winter ... (for Viola and Violoncello) performed by Sarah-Jane Bradley (Vla) and Graham Walker (Vlc). A new CD to include a series of four String Duos and recordings of Threnodia and Dimensions of the Present Moment will be released in 2017.